The search by scientists to find ways to combat obesity continues. Recently, investigators have been exploring whether they can engage the lymphatic system to help regulate obesity-induced inflammation of fat (adipose) tissue and restore systemic metabolic fitness. In a study appearing in The American Journal of Pathology, published by Elsevier, researchers report that augmenting lymphatic vessel formation in obese adipose tissue via vascular endothelial growth factor (VEGF-D) signaling reduced obesity-associated immune accumulation and improved metabolic responsiveness, suggesting a new approach to ameliorating some obesity-associated metabolic abnormalities. In obesity, adipose tissue expands and becomes dysfunctional, leading to the appearance of a cluster of medical issues known as “the metabolic syndrome,” which includes increased blood pressure, high blood sugar, excess body fat around the waist, and abnormal cholesterol or triglyceride levels. The adipose tissue found in obesity exhibits symptoms of chronic inflammation, including hypoxia, immune cell accumulation, and fibrosis, leading to spilling over of pro-inflammatory substances and excess lipids into the circulation. This allows fat to circulate and be deposited in other tissues that are less well-equipped to safely store it. Normally, the primary function of the lymphatic system is to transport lymph, a fluid containing infection-fighting white blood cells, throughout the body via lymphatic vessels. Lymphatic vessels are similar to the circulatory system's veins and capillaries. The lymphatic vasculature and lymphatic endothelial cells in tissues are essential for maintaining tissue balance through the uptake and transport of peripheral fluid, large molecules, and immune cells. Tissue inflammation is often accompanied by the formation of new lymph vessels, a process known as lymphangiogenesis. Although obesity seems to inhibit lymphangiogenesis and reduce lymphatic function in adipose tissue, the goal of this research was to determine whether artificially enhancing the lymph system in obese adipose tissue can be beneficial. The investigators developed a new transgenic mouse model to test their hypothesis. The model allows for activation of vascular endothelial growth factor receptor-3 (VEGFR-3), a receptor known to regulate lymphangiogenesis, by elevating expression of its ligand VEGF-D from fat cells. Unlike human VEGF-D, mouse VEGF-D does not affect blood vessel formation or function. The investigators used these inducible adipose VEGF-D overexpressing (Adipo-VD) mice fed a chronic high fat diet to identify the impact of increased VEGFR-3 signaling and lymphatic density in obese fat. Inducible overexpression of VEGF-D in obesity expands adipose lymphatics. A: RNA expression for the lymphangiogenic VEGFR-3 ligands Vegf-c and Vegf-d is physiologically elevated in high-fat diet (HFD)—fed obese mouse inguinal adipose tissue compared with chow-fed mice. B: Induction of VEGF-D translation in Adipo-VD mice elevates Vegf-d and lymphatic endothelial cell marker RNAs in inguinal white adipose tissue. C: Brown adipose tissue exhibits higher VEGF-D RNA induction in Adipo-VD mice. D: Immunofluorescence of lymphatic (green; LYVE-1) and blood (red; endomucin) endothelium in inguinal white adipose tissue. E: Quantitation of LYVE-1e and endomucin-positive pixels on inguinal adipose tissue section images. F: Immunofluorescence of lymphatic (green; LYVE-1) and blood (red; endomucin) endothelium in interscapular brown adipose tissue. G: Quantitation of LYVE-1— and endomucin-positive pixels on brown adipose tissue section images. H: Podoplanin (green) and Prox-1 (red) labeling of lymphatic structures in brown adipose tissue. I: VEGFR-3 (green) labeling of lymphatic structures in white adipose tissue. Blue shows DAPI in all images. J: Whole-mount LYVE-1 immunofluorescence in inguinal white adipose tissue demonstrates LYVE-1+ cells resident in adipose tissue. In Adipo-VD tissue, lymphatic structures form between and around adipocytes. n = 4 (A); n = 8 (B and D—G). *P < 0.05 versus _rtTA. Scale bars: 100 μm (D, F, I, and J); 50 μm (H). “We demonstrated that augmenting VEGF-D signaling specifically in adipose tissue induces lymphangiogenesis and improves glucose and lipid homeostasis during obesity,” said Dr. Rutkowski. “The studies showed that despite equivalent weight gain, the Adipo-VD mice demonstrate reduced systemic insulin resistance, liver lipid deposition, and adipose immune accumulation when compared to their littermates. For a long time, we did not think this model worked. Native lymphatics in mouse adipose are quite sparse. It turns out that our VEGF-D expression level was relatively low and lymphangiogenesis in this context takes months. It does align well with the four-month time course of diet-induced obesity that we used. We still have more mechanistic work to do, but the phenotype is exciting,” concluded Dr. Rutkowski. 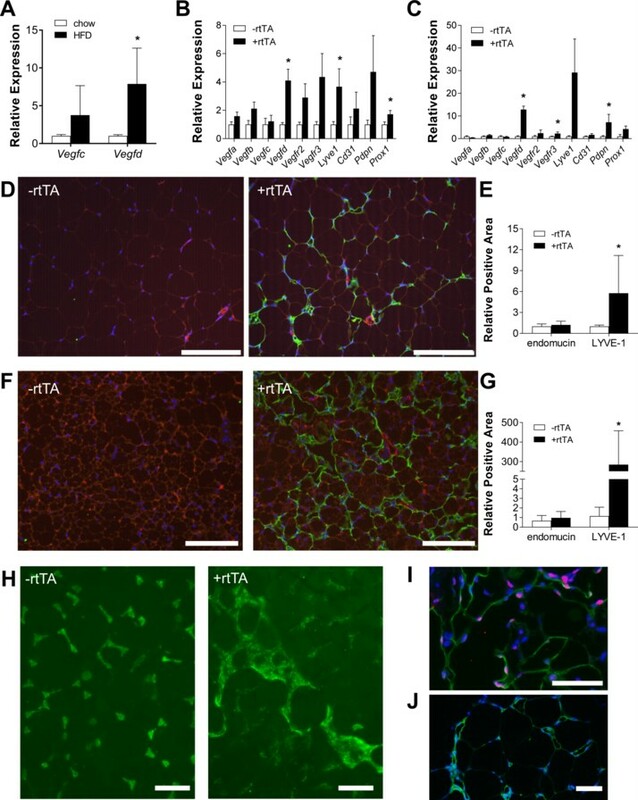 These findings highlight the importance of lymphatic expansion in maintaining tissue homeostasis and identify a potential new target in the amelioration of the metabolic syndrome associated with obesity. The article is “VEGF-D overexpression and lymphatic expansion in murine adipose tissue improves metabolism in obesity,” by Adri Chakraborty, Sheridan Barajas, Gabriela M. Lammoglia, Andrea J. Reyna, Thomas S. Morley, Joshua A. Johnson, Philipp E. Scherer, and Joseph M. Rutkowski (https://doi.org/10.1016/j.ajpath.2018.12.008). It will appear in The American Journal of Pathology, volume 189, Issue 4 (April 2019) published by Elsevier. This study was supported by the American Heart Association (17GRNT33671220), the Texas A&M University Health Science Center College of Medicine and Department of Medical Physiology, the NIH (R01-DK55758, R01-DK099110 and P01-DK088761-01), and the Lipedema Foundation. Full text of the study is available to credentialed journalists upon request; contact Eileen Leahy at +1 732 238 3628 or ajpmedia@elsevier.com. Journalists wishing to interview the authors should contact Christina B. Sumners, Communications Coordinator, Office of Marketing and Communications, Texas A&M University Health Science Center, at +1 979 436 0616 or sumners@tamhsc.edu.